There really is no one like Nathaniel Parker Willis (January 20, 1806 – January 20, 1867), the American poet, editor, publisher, travel essayist and, for a time, the highest-paid magazine writer of his day. He was born in Portland, Maine, and raised in Boston, before making his career as a New York writer and a member of the Knickerbocker group. Though barely remembered today (and, when he is, usually for his associations with other writers), he was a powerhouse of the antebellum period. At one point, for example, he was a regular columnist for three different publications, causing even Henry Wadsworth Longfellow to be jealous of his income. A quick read through Pencillings by the Way or Out-doors at Idlewild reveals little substance in Willis. However, he was one of the earliest Americans to travel to Europe and write back about his experiences. His prose drew readers in using a style that addressed them directly as close, intimate friends. He made it seem that he was just a rustic American who happened to get lucky and implied that anyone could trade places with him. And the snow-fall is noiseless as a thought. With a complaining whisper. Winter’s dumb! Under the shadow of his hand. Look up! There are no sunny places to lie down. Your eye upon the beauty of the young. That Winter with the dying year should come! Birth and death of Nathaniel Parker Willis originally appeared on The American Literary Blog on January 20, 2010. 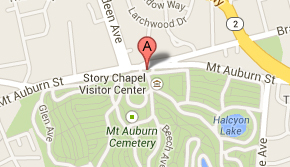 Nathaniel Parker Willis is buried in Lot # 972 on Spruce Avenue at Mount Auburn Cemetery. His funeral was held on January 24, 1867. 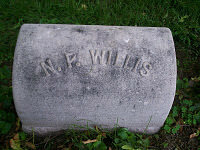 Many thanks Rob Velella for your research on Nathaniel Parker Willis. I had always been told he was a cousin of my Wells family, but I only found out many years later from a Suffolk Probate will that he was somewhat of a cousin by marriage. Your concise commentary is much appreciated for giving us some idea of his placement in America’s literary past.–Charles Chauncey Wells, historian and author on Boston’s burying grounds and New North Church. Oak Park, IL 1-5-2015.